Chissell helps large electricity customers shift their use away from peak times, when the cost of producing the power is at its highest. The utilities that would have to supply that expensive peak power save money on their generating costs, and they’re willing to share the savings with customers who scale back their energy use. Some companies are willing to “buy” the power customers don’t use. Selling that “virtual” power to the highest bidder can net the electricity customer a tidy return—and it helps the environment by reducing the amount of electricity needed from greenhouse-gas-producing fossil fuels. Even before he joined Viridity, his enthusiasm for sustainability solutions led him to a leadership role in Swarthmore’s efforts to lessen its impact on the planet’s resources. “I had gotten impassioned about sustainability” around 2007, he says. He was living in the Swarthmore area and visited the president of the college, Al Bloom, several times to advocate for more sustainable campus practices. “I was impatient and frustrated at what seemed [the College’s] noncommittal stance,” he says. His interest in sustainability had roots in his study of feng shui, the Chinese art of creating harmonious surroundings. The first year after he graduated with a degree in psychology, Chissell became a feng shui instructor and consultant. In 2008, the College created a Sustainability Committee. President Bloom knew Chissell would make an excellent alumni recruit. Says Chissell, “It was something I took a stand for. 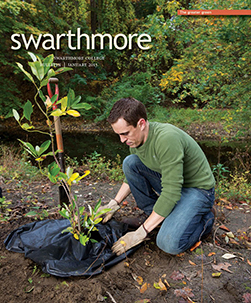 Swarthmore people united around making a difference. It’s rewarding to see all the progress. “We were able to get a sustainability coordinator [for 10 months],” he notes. “Students came up with some incredible projects that got funded. We created a revolving loan fund … The students created gardens. They came up with a project for using nonchemical fertilizer on the grass” on campus. Other advances from the late 2000s of which Chissell is proud include: Sharples Dining Hall installing energy-saving LED lights, and President Rebecca Chopp signing the American College & University Presidents’ Climate Commitment. Signatories agree to work toward achieving climate neutrality on their campuses by mid-century. 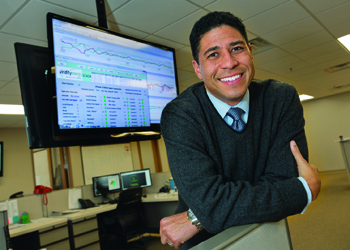 The demands of his job at Viridity have increased, so Chissell has less time to devote to campus sustainability efforts, though he did start the Swarthmore Sustainability Network on LinkedIn, which now has more than 300 members.